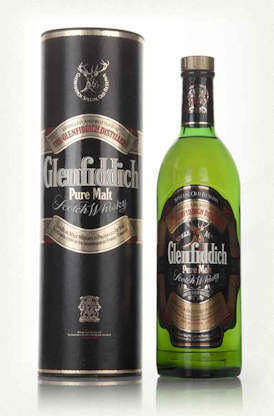 Glenfiddich 8 Year Old Pure Malt Whisky is produced in the Speyside region of Scotland. The word Glenfiddich has a meaning in Gaelic of Valley of the Deer. Pure malts are made by mixing SIngle Malts whiskies from the same distillery which created a mixed single malt. Another name for Pure Malt is a vatted malt. The Glenfiddish 8 Year Old Pure Malt has a number of Single Malts included in the mix and the 8 Years Old means that all the Single Malts that have been added to make this whisky are at least 8 Year Old, but the youngest one is of an age of 8 Years. This whisky was bottled in 1980 and is a pure malt. Because of this it is more expensive than the normal single malt that you will find from the Glenfiddich range in the off licences throughout the world. The Glenfiddich 12 Year Old Single Malt is one of the best selling Single Malt in the world and comes in at a price of under �23, but this pure malt is around �120. Glenfiddich have malts for every occasions and prices range from the standard 12 Year Old all the way up to Glenfiddich 18 Year Old Ancient Reserve which is just under the �300 mark. These can all be bought at the Whisky Exchange and details are below on this page. There are more expense whiskies from Glenfiddich but as this page is about the Glenfiddich 8 Year Old Pure Malt is out of scope for this page. Glenfiddich Malt Whiskies are owned by William Grant & Sons Ltd and is set in the Highlands of Scotland, but in the Speyside whisky region. It has been in operation since 1886 when William Grant built the �distillery from scratch with help from his family. Today the distillery is still run by the decedents of William Grant and therefore is still truly a family run business making the highest quality whisky that is within the market place. The actual Glenfiddich Single Malt range accounts for around 30% of single malt whisky sales worldwide and this is an amazing fact considering on the amount of single malt that are available. This whisky is famous for the triangular green bottle that this range of whiskies use and can be bought in nearly every drinking country in the world. You can take a tour of the distillery and is a must if your in the area as this distillery was voted Best Distillery Visitor Centre in the annual vote by Scotland Magazine in 2007. This shows cultural wealth within the distillery centre and was voted by the magazine reading in March of that year. It was also voted Scottish Visitor Attraction of the Year in the same year and just shows the importance of distilleries like this to the Scottish tourist industry. Current the distillery is open for tours between Monday 20th Oct - Fri 19th December at a set time of 9.30pm to 4.30pm, but no tours are carried out over the weekend. Booking must be made for a tour and there is a maximum of 12 people allow at the one time. The distillery tour is free and is a very interesting visit. You will find out about the history of the distillery in a short film and then be shown around the facility so you get a amazing inside view of how the Glenfiddich Single Malt are produced.